face to facebook modest victory! there was enough drama that i thought i wouldn’t get out the door, but i own the first leg of the f2fb short trip! i drove down to the target superstore in bourbounnais, illinois. heather tyler is my facebook friend–she’s the wife of eric who is friends with john lafond. heather is 38, adorable, and when she smiles you just can’t have a bad day! 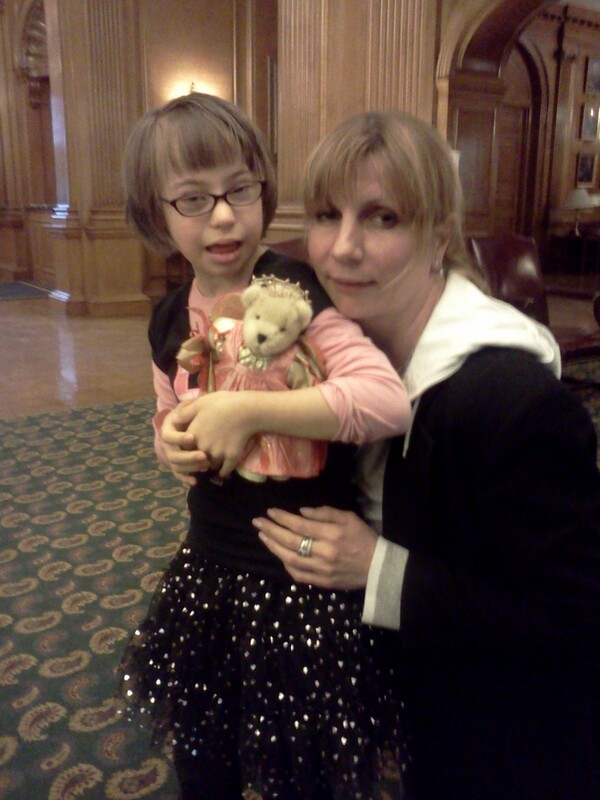 we had lunch and shopped for a present for the princessa of champaign-urbana. heather doesn’t always want to work at a target store although she’s great at what she does-and she spends a lot of time when she’s not at working playing on facebook: mafia wars, farmville, etc. she wants to do something in art history. i thought maybe she could contact the head of nearby kankakee’s historical society and see if she could work in their museum as a volunteer just to get her feet wet. heather and i both struggle with internal monologues that are sometimes rather dire. here’s a picture of her just after we ate lunch. i’m very lucky to have heather for a facebook friend and i’m glad we got to see each other. unfortunately, her husband eric was at the food pantry and missed me as i sailed off for champaign urbana. i’ll get to see heather later because i’ll be coming back to kankakee to see eric! the princessa’s parents are john and alice lafond. john and i went to school together and when i left the patricks when i was a young teen, he hid me in the lafond family garage. the lafonds are approaching their ten year anniversary. congratulations to a wonderful royal couple!!! john and i play scrabble on facebook. he beats me nearly every time. and jonathan boyd, his friend, DOES beat me every time. John also plays Mafia Wars, Farmville, and Sorority Sisters. I asked “why Sororority Sisters”? and he said it’s basically the same thing as Mafia Wars just with prettier dresses. facebook is a hobby. tomorrow it’s onward to indiana! i’m doing this! i’m really doing this!!! i have 332 friends, including one cat and a guy who’s been dead for over a century–sorry mike i added a few friends, but i have visited with nine of them this year. this is right around the time that most people give up on a new years resolution–but i had that moment last night. This entry was posted on Friday, January 14th, 2011 at 11:29 pm	and tagged with alice lafond, colleen, facebook, friendship, heather tyler, john lafond and posted in Uncategorized. You can follow any responses to this entry through the RSS 2.0 feed. « disaster!!!! and then. . .